Seen today from the Clyde waterbus PRIDE O' THE CLYDE, the Siem Offshore Multipurpose Field and ROV Support Vessel SIEM SWORDFISH has been in Glasgow's King George V Dock since Wednesday. 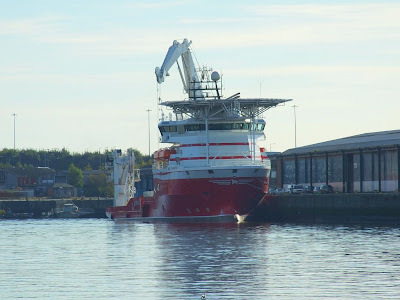 Newly completed by her Norwegian builders, Kleven Verft AS, SIEM SWORDFISH is on a five-year charter to Veolia Environment Inc, with an option for the charterer to purchase the vessel at its end. Her use will include ROV support, subsea surveys, diving support, subsea inspection, maintenance, repair and construction. Her visit to Glasgow is to load equipment for this role. The ship herself has a diesel electric machinery installation, with Caterpillar engines and Rolls-Royce AZP100FP azimuthing thrusters to provide main propulsion. The large crane visible is capable of a 150-tonne lift, and can work to a depth of 3,000 metres.